The core of the BODYGUARD® Anti-Cartel-Mattress is made of innovative QXSchaum® Mattress Foam. As the most advanced mattress material in the world, this ensures optimal sleeping comfort. There’s a reason the BODYGUARD® has consistently received the best possible ratings from Stiftung Warentest since entering the market. See for yourself. In any situation. In any position. For anyone. 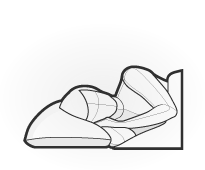 All body shapes can lie comfortably on the BODYGUARD® in any sleeping position. Whether big, small, heavy or light, whether you sleep in a back, side or prone position. The BODYGUARD® is perfect for everyone. That includes you. Safely test how you sleep at home with our 100 Night Trial. See for yourself and experience the BODYGUARD®. Long durability. 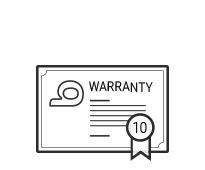 We provide a 10-year warranty for the mattress core. 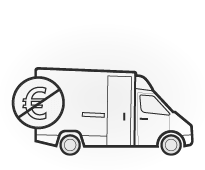 Have your order delivered to your door, free of charge within Germany. With the 18.5 cm high BODYGUARD® Anti-Cartel-Mattress, you have a choice: would you rather sleep on a medium firm bed, or on a firm bed? Upper side and lower side provide you with different levels of firmness in accordance with DIN EN 1957 – you can sleep on the side you prefer. Simply flip it over! Whatever your choice, your body will be optimally supported on the BODYGUARD®. The BODYGUARD® is subdivided into symmetrically-arranged ergonomic modules for the head, neck, shoulder, lumbar and pelvic regions. The ergonomic module areas below the pelvis “automatically” become the thigh, calf and foot zone. With this simple but ingenious system, the BODYGUARD® ensures the best lying properties for all regions of the body, regardless of your lying position. The breathable HyBreeze® Cover on the BODYGUARD® Anti-Cartel-Mattress, which Stiftung Warentest ranked “very good” (“test” 10/2018), allows optimal wicking of body moisture and ensures a comfortable sleeping environment. A practical all-round zipper divides the removable cover into two halves and thus makes it possible to wash these separately in a house­hold washing machine. The BODYGUARD® is a clean mattress and has been tested according to Oeko-Tex® Standard (Test no. 17.0.21008 Hohenstein) in the strictest Class 1. The result: It contains no softeners, flame retardants or pesticides. The Federal Institute for Materials Research and Testing (BAM) likewise confirms that the BODYGUARD® meets the stringent requirements for ambient air emissions. The 18 cm high core of the BODYGUARD® Mattress consists of high-quality QXSchaum® Mattress Foam, an exception­ally elastic and durable poly­urethane foam (PUR). This is more stable than mattress cores made of conventional materials. Due to its density, QXSchaum® Mattress Foam also gets away with having a very low weight. This facilitates transport and optimizes handling, which is likewise confirmed by the very good Stiftung Warentest test result in this category (rating: 1.2 – “test” 10/2018). In many mattress models, body impressions form at night and rebound only during the course of the day. Over time, these expand and become deeper. This is not the case with the BODYGUARD® Mattress. Here, the durable QXSchaum® Mattress Foam provides consistent dimensional stability. Whether in the morning or in the evening, after a day, a year or after ten years of use: The BODYGUARD® retains its shape. Stiftung Warentest attests this with a rating of 1.6 in the category “durability” („test“ 10/2018). With the BODYGUARD® Anti-Cartel-Mattress, you are choosing a particularly high-quality product that you will no longer want to do without. Each mattress core in the many sizes available is made of a single piece and thus offers you the best sleeping comfort. Order your desired size with just one click and the BODYGUARD® will help you dream. Thousands of satisfied customers and best results at Stiftung Warentest. The BODYGUARD® is and remains the undisputed leader. Find out more about mattress tests here.